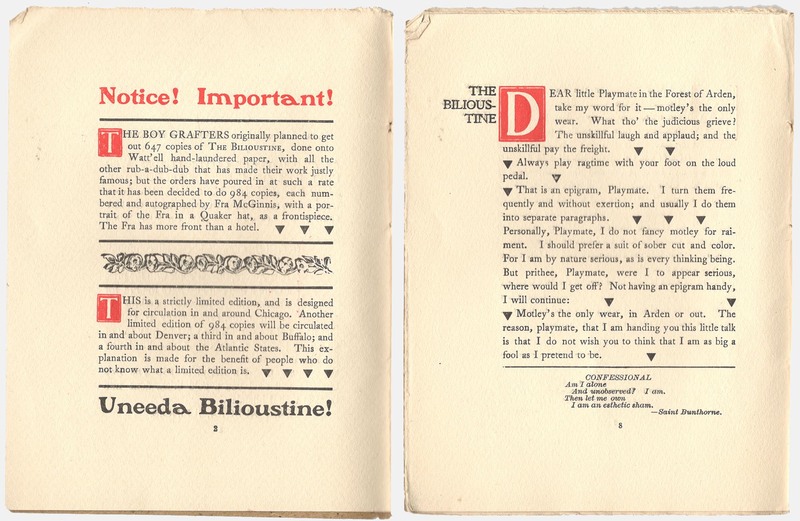 “The Bilioustine’s” two issues and the Dec. 1901 Philistine. Parody Of: The Philistine. Title: “The Bilioustine.” By: Bert Leston Taylor. Dates: May and October 1901. Published By: William S. Lord of Evanston, Illinois. Availability: Free online here; print copies findable but pricey. “The Bilioustine” may have been this country’s first full-length magazine parody, though no one thought to make that claim when it was published back in 1901. 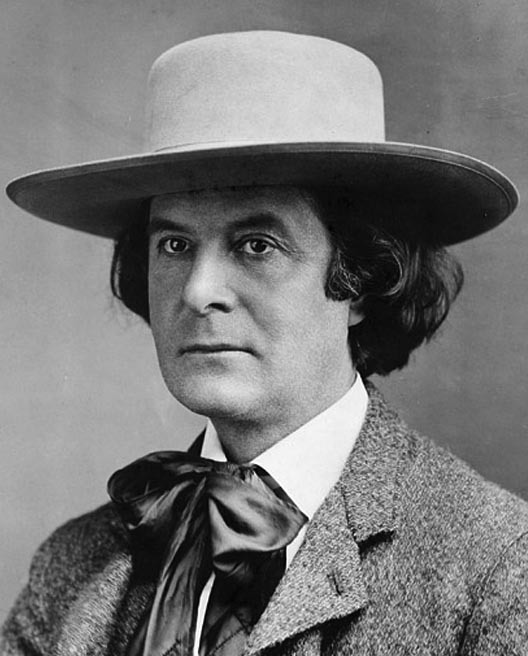 It’s still one of the funniest, thanks to the wit of author Bert Leston Taylor and the barn-size targets provided by Elbert Hubbard and his self-published organ, The Philistine. 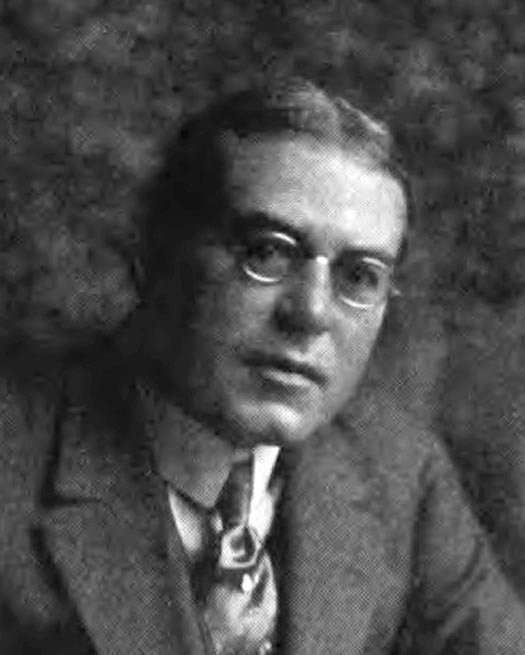 Elbert — not to be confused with L. Ron — Hubbard is dimly recalled today, but at the dawn of the last century he was one of the most famous writers and lecturers in America. A former soap salesman with a facile pen and an Barnum-like gift for publicity, Hubbard combined a passion for the arts-and-crafts movement of the 1890s with a keen eye for the main chance. After making his name with a collection of moralizing travel sketches called Little Journeys to the Homes of Good Men and Great, he launched The Philistine: A Periodical of Protest in June 1895 as a platform for his thoughts on culture, politics and other matters. Within a few months he was printing it himself on second-hand equipment in an old barn near East Aurora, New York; he dubbed this set-up the Roycroft Press, after a family of 17th-century English printers. Its success drew other artisans to New Aurora, and by the time of Hubbard’s death in 1915 there were more than 500 “Roycrofters” working in 14 buildings. The Philistine was one of hundreds of self-consciously “little” magazines that sprang up in the mid-’90s, partly in reaction to the emergence of mass-market behemoths like the Ladies’ Home Journal (born 1884) and Saturday Evening Post (1821, but reborn 1897). 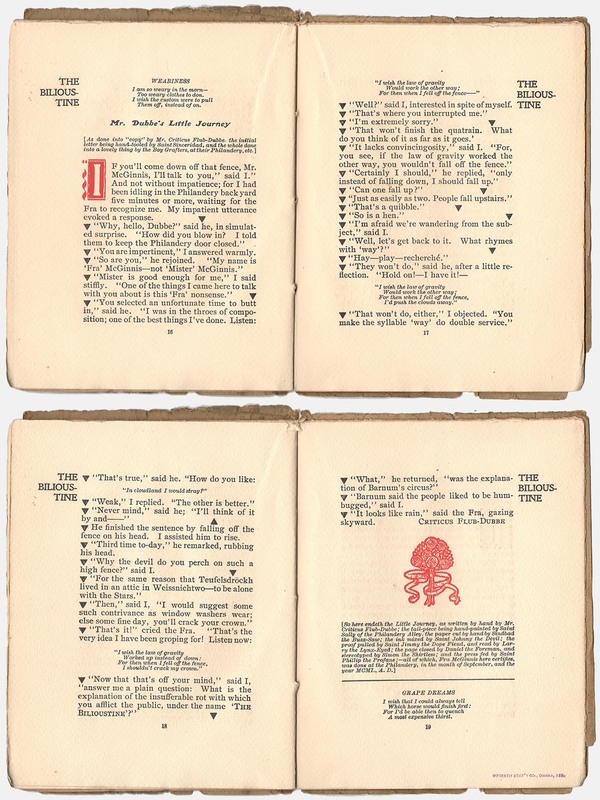 Unlike those titles, the little magazines offered “a small or odd-shaped page, fine typography and printing, and cleverness and radicalism in criticism,” in the words of historian Frank Luther Mott. They had names like Angel’s Food, the Bauble, the Goose-Quill, Jabs and Stiletto. Most struggled to find readers and had the lifespan of mayflies. The Philistine was an exception: It ran 20 years and reached a circulation of 200,000 — ten times that of its best-known contemporary, the Chap-book. A typical issue contained 32 pages of editorial matter and at least as many of ads, all printed on brown butcher paper and bound with gold thread. Though its contributors included Stephen Crane and Oz illustrator W.W. Denslow, The Philistine‘s voice was pure Hubbard. He wrote countless signed and unsigned editorials, poems and homilies — including “A Message to Garcia” (1899), a brief sermon on duty in war and workplace that struck a chord with the millions and entered countless anthologies. …and so on. His other style was down-to-earth and satirical, with echoes of Ambrose Bierce: “Genius may have its limitations,” he wrote, “but stupidity is not thus handicapped.” He flayed the publishing industry, fellow writers, the professions, organized religion, imperialism, sexual prudery and the tyranny of marriage. (“Never get married in college; it’s hard to get a start if a prospective employer finds you’ve already made one mistake.”) For a while he mocked the idle rich, but scorn turned to flattery as his own fortunes waxed. “The Superior Class is a burden,” he wrote in 1903; “no nation ever survived it long.” Ten years later he was attacking trust-busters for destroying “creators of wealth” and golfing with John D. Rockefeller. Similarly, his sermons against monogamy tapered off after his first wife divorced him and he married his mistress. A “Little Journey” to Fra McGinnis in the October issue. “It would be possible to place a higher value on Hubbard’s writings, essentially vulgar though they were, if one could believe in the man’s sincerity,” Mott wrote, but those writings were manna for a culture-starved audience hungry for something high-minded but not too demanding. Meanwhile, his more sober contemporaries tended to find Hubbard’s prose impossible and his affectations maddening: The flowing locks, the wide-brimmed sombrero, the soulful posturing. He styled himself “Fra Elberto” like some medieval monk and called his followers “the Society of American Immortals.” Much of this was tongue-in-cheek, but still…. 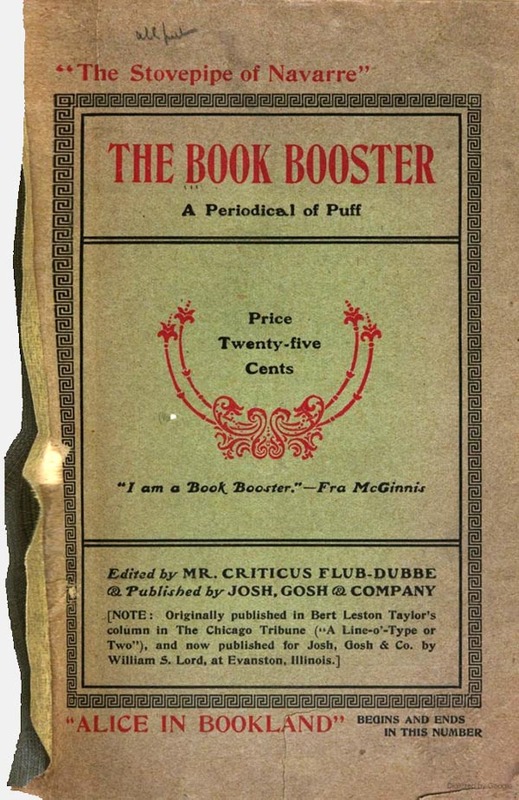 Within a month, Taylor-as-McGinnis had written enough material to fill a small magazine, and in May he collaborated with publisher William S. Lord of Evanston, Ill., on the first issue of “The Bilioustine: A Periodical of Knock.” It wasn’t the first burlesque of the little-magazine phenomenon, but it was the first to target a specific title. Taylor was a former typesetter, and he made sure his 24-page, 6″-by-4″ pamphlet resembled The Philistine in layout, page size and paper stock. It was an immediate hit. “As a well aimed shaft of ridicule there is nothing to equal it. As a piece of humor it is a gem,” wrote the Denver Republican. The St. Louis Mirror called it “one of the best parodies issued in the last twenty years.” A second issue with new material followed in October to similar acclaim. Nothing about The Philistine escaped ridicule in “The Bilioustine,” from its sampler-like homilies set in decorative borders (“Art is long — Why not hair?”) to its advertisements for deluxe editions “carefully impressed upon What’ell hand-laundered paper, bound in burlap specially imported from Burlapia, and stenciled by the cunning hand of Saintess Genevieve.” Other ads pushed the Fra’s “Little Journeys to the Scenes of Famous Explosions” and hinted at his dalliances under the heading “Affinities Wanted, Female.” The essays sandwiched between these notices were all either by or about Fra McGinnis, the latter rather more skeptical than the former. This entry was posted in Newsstand Parodies, The U.S.: 1850-1910 and tagged 1900s, Bert Leston Taylor, Bilioustine, Elbert Hubbard, Magazine, Philistine. Bookmark the permalink.